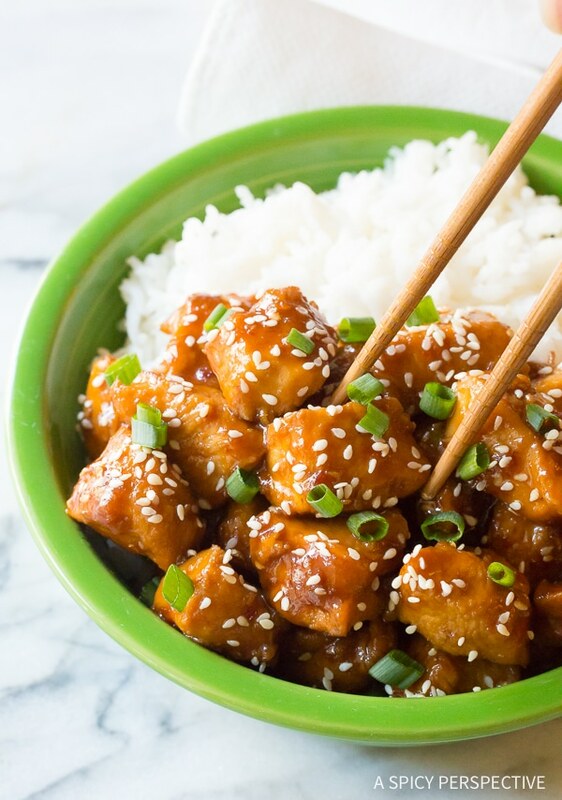 Perfect Instant Pot Chinese Sesame Chicken, with a sticky-sweet sauce and a little kick! Everyone in our family is crazy over Asian cuisine, especially the kids. Although we think they should get to have a say in family plans, we sometimes steer them toward barbecue or other ethnic cuisines, just to mix things up. At home it’s the same. If I ask either of my kids what they want me to cook for dinner it’s almost always Chinese Hot Pots, Korean Pajun Veggie Pancakes, Beef Bulgogi, Cantonese Lo Mein, Thai Panang Chicken Curry, and so on. Now that I’ve (finally) bought an Instant Pot, I decided to try cooking some beloved Asian dishes in it, and I think I’ve got a winner! 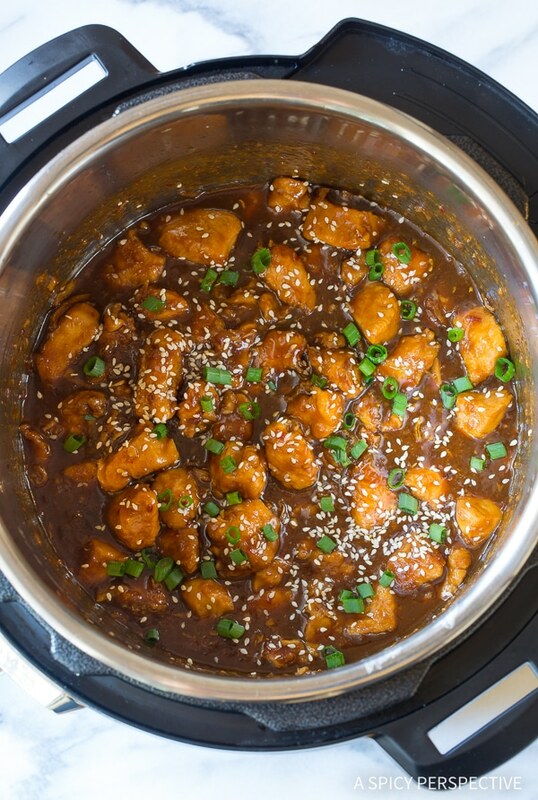 Today’s Instant Pot Chinese Sesame Chicken, is so fast and easy to make. Plus, it’s a healthy sesame chicken recipe, compared to takeout sesame chicken. 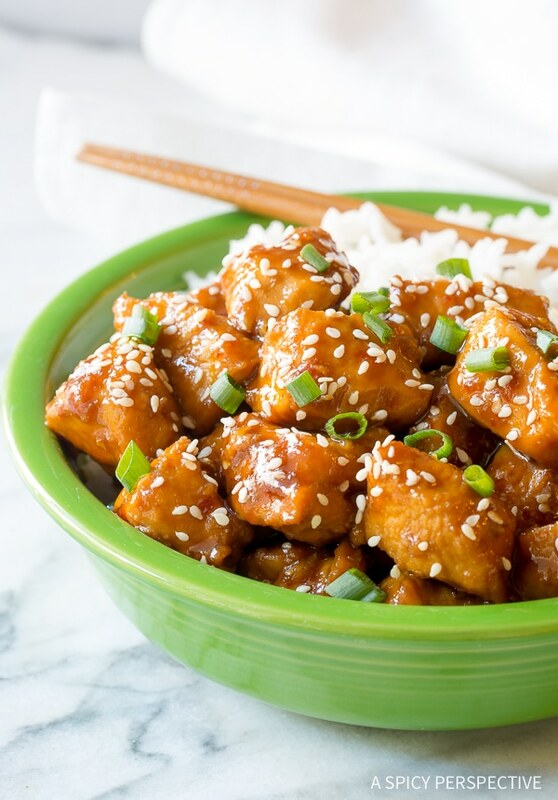 Our Instant Pot Chinese Sesame Chicken is not deep fried, so you lose the fat and calories from breading and fry oil, yet it still offers bold spicy-sweet flavors, and a deep nutty sesame note. What’s the Difference Between Sesame Chicken, General Tso’s Chicken, and Orange Chicken? People often get these three dishes confused, due to their similarities. All three are traditionally deep-fried chicken recipes, bathed in a sticky-sweet glaze. Think of sesame chicken as the “mother” recipe. It’s salty, sweet, and light on heat, with rich undertones and sesame seeds sprinkled over the bites of chicken. 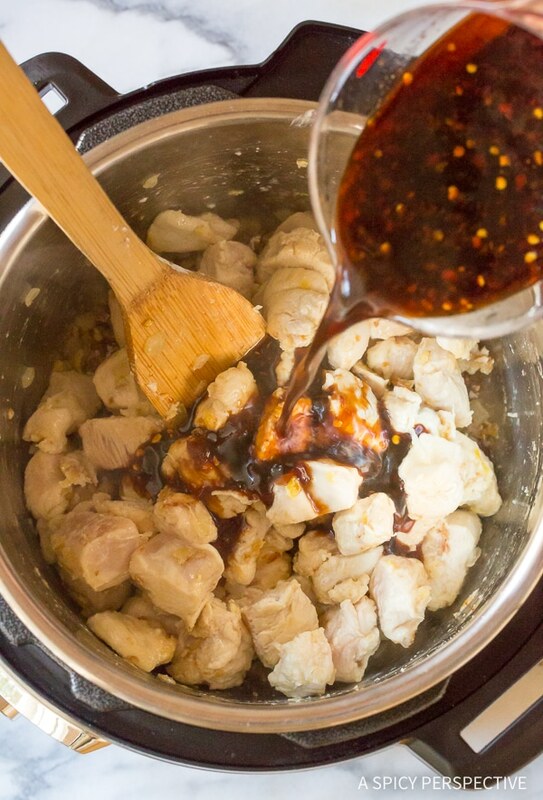 The glaze is usually brown to reddish-brown from the addition of soy sauce, brown sugar (or honey for Honey Sesame Chicken Recipes,) and sometimes tomato. General Tso’s is very similar. However, it usually does not contain sesame seeds, but does offer a good bit of spice from the addition of chiles. Of the three, General Tso’s chicken is the most likely to be served with additional vegetables mixed in, like bell peppers and onions. Orange chicken is usually the sweetest of the bunch. It is not normally spicy or covered in sesame seeds. However, it does have a unique orange essence from the inclusion of orange peel and/or orange juice. Although there is a stand-out element in all three dishes, they are very much alike, so recipes do overlap at times. 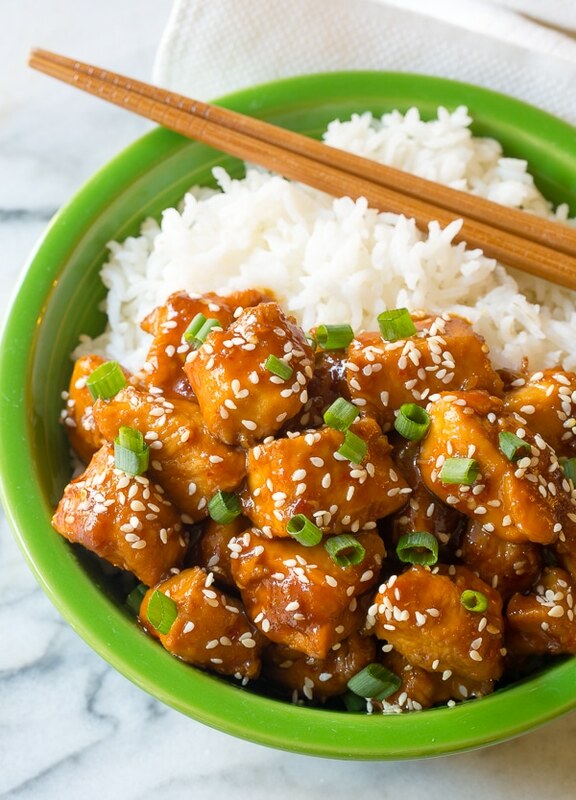 In today’s Instant Pot Chinese Sesame Chicken Recipe, I’ve included all the best attributes of classic sesame chicken, yet have cut the fat and added a touch of spicy heat. Does this make it General Tso’s Chicken? Nah. 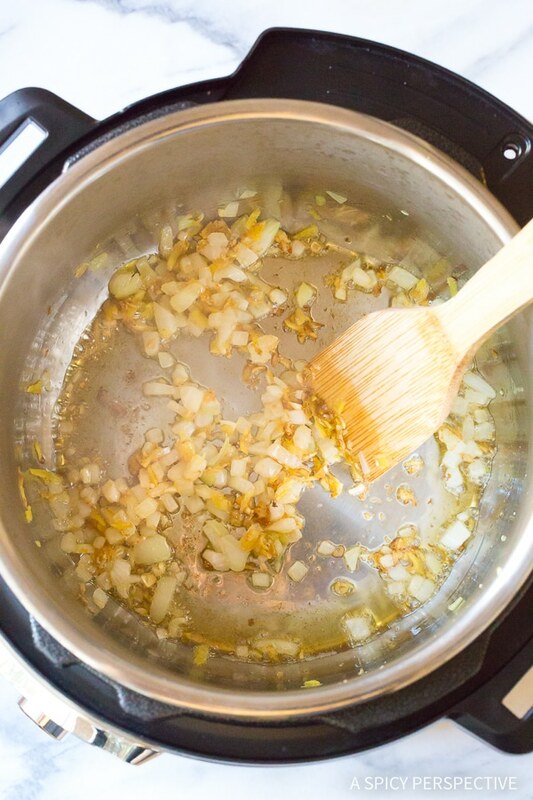 Start by sautéing onions, garlic, and ginger in sesame oil. Coat chunks of chicken breast in cornstarch and then brown them in the oil. Add the ingredients for the sauce and stir to coat the chicken. Then lock the lid into place and set the Instant Pot to pressure cook for 3 minutes. Once it’s done, safely release the steam and remove the lid. Sprinkle your perfect pressure cooker sesame chicken with sesame seeds and scallions. Serve it with rice, or steamed vegetables for a low(er) carb meal! PS – You can also make rice in your Instant Pot. If you want to make the chicken and the rice in the pressure cooker, I would make the rice first, then clean out the pot and move onto the sesame chicken. Instant Pot Chinese Sesame Chicken Recipe - An easy pressure cooker version of classic Honey Sesame Chicken with a kick, similar to General Tso's Chicken. Cut the chicken into 1-inch cubes, and toss the cubes with cornstarch to coat. Prepare all the herbs and vegetables. Set the Instant Pot on Sauté. Pour in the sesame oil. Add the onion, garlic, and ginger. Sauté for 2 minutes, then add the chicken pieces. Stir and brown for 3-5 minutes, until the chicken pieces are golden on most sides. Add the brown sugar, soy sauce, sherry, chili garlic sauce, and 2 tablespoons water to the Instant Pot. Stir well to coat the chicken. Cover and seal the pot. Set on Pressure Cook High for 3 minutes. Turn off the pressure cooker, and perform a Quick Release. Once the steam valve button drops, and it is safe to open, remove the lid. Stir the sesame chicken and sprinkle with sesame seeds and scallions. 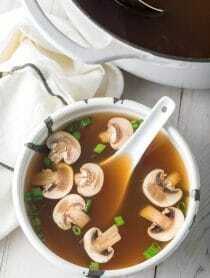 Serve warm with rice, quinoa, or with steamed vegetables. Photos show red pepper flakes in the sauce, but ingredients list doesn’t. Also, chicken needs to be split into two batches in order to brown appropriately . The red you are seeing is coming from the chile garlic sauce. You can definitely split the chicken into batches if you want, but it does not need to be fully caramelized or crisp on the outside. It’s pressure cooked and bathed in sauce, therefore browning it a little in one batch is fine. Happy Cooking! This was amazing! Thank you so much for sharing. 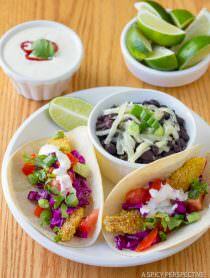 Can I use xanthan gum or almond or coconut flour instead of cornstarch? Would that change anything? I haven’t tried xanthan gum, but I know from experience you can use arrow root in the same proportions. Hope this helps! The sauce in the recipe tastes fantastic, however while cooking I received the burn error several times while cooking. Since I couldn’t tell if my dish was cooking or not I ended up with very dry, over cooked chicken. I would try this again but on the stovetop. I received a burn notice too. How do you avoid that with this recipe? I was surprised to see you saute with sesame oil since it has a low burning point. Wouldn’t it be better to saute in canola and add the sesame oil with other liquid ingedients after sauteing the chicken, garlic, ginger, etc.? My other question was about low sodium soy, which I do keep on hand with regular. Would the dish be way too salty with regular soy? The sauté setting on an Instant Pot is pretty low, so you don’t have to worry about burning the oil. Yes, I think I might reduce regular soy sauce a little bit so it’s not overly salty. Maybe use 1/4 cup? If I had doubled the chicken and the sauce do I double the pressure time too? No, I believe you double the ingredients, but keep the cooking time the same. 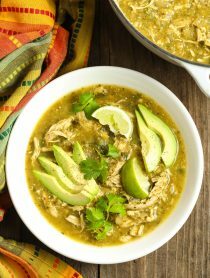 Here’s a link with Instant Pot doubling tips: https://www.hippressurecooking.com/how-to-double-a-pressure-cooker-recipe/ Hope this helps! Can I omit or replace the sherry? Yes, you can swap it for water or broth, but it does really add to the flavor. You can buy small bottles of cooking sherry at your local grocery chain. If converting to a slow cooker, how much time should this cook? Between the sherry and the scallions there is something that just says “3 tbsp”. Is that just a typo or is there another ingredient? Your Chinese Sesame Chicken sound wonderful , but I do not have and instant pot . Can I use a Dutch oven pan in place of an Instant Pot ? This was a huge hit tonight. I doubled it and there was not one crumb left! I am using an 8 qt and keep getting a burn notice until I add extra water. It takes about three times to get the pressure cooker to work without getting the burn notice. Any ideas on what I am doing wrong? Otherwise the taste is fantastic. We love it!! Hmmm… Mine is a standard 6 quart, and after testing this recipe multiple times, I’ve not had that same issue. It must have to do with the size. If it were me, I would figure out how much extra liquid you need, then make that adjustment with all the pressure cooker recipes you try. Good Luck! I got my Instant Pot for Christmas and finally tried it out. 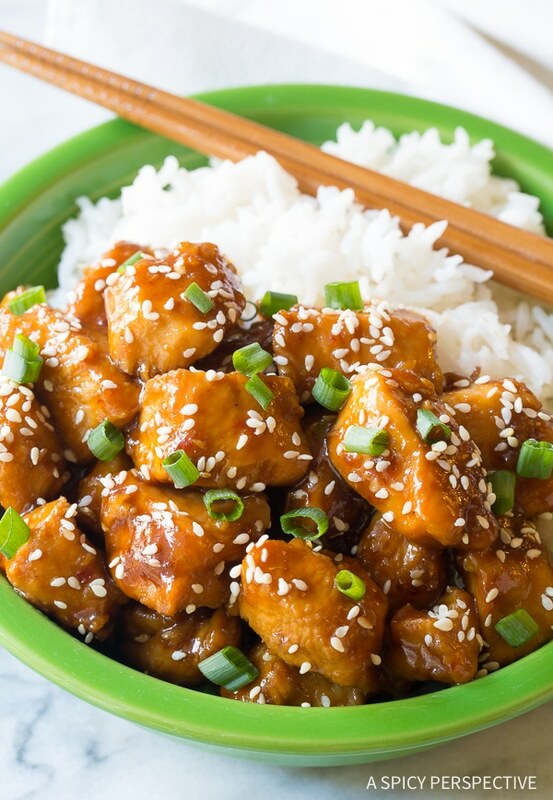 I love Sesame Chicken and this was so quick and easy. It was delicious too! I might go a little lighter on the Spicy Garlic Chili next time but it wasn’t so spicy that it made me cry like some spicy foods.